We carry the full line of Master Lock® locker locks, including built-in, padlocks, and ADA locks. 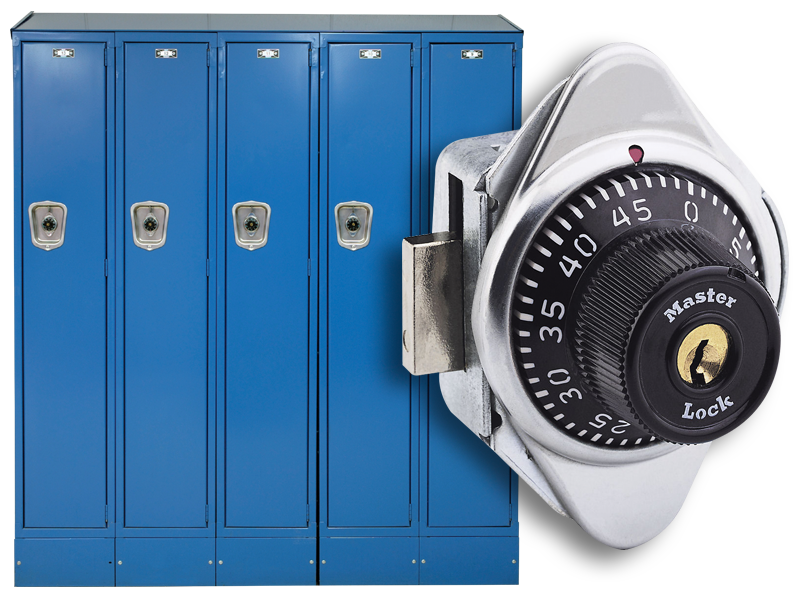 Let us help you restore your lockers to 'like new' condition with our experienced locker repair crew. Master Lock® locker locks, the brand recognized everywhere as the leader in security products. Why refurbish your lockers rather than just replacing them? 80% savings, that's why. American Office Services offers a full range of locker solutions, including electrostatic painting, locker repair, and Master Lock® locker locks. We don't just take on one locker, we take on the whole hallway, school, gym, University, office, or any other locker hosting facility. Our experienced and knowledgeable crew come in, inspect all lockers, ensure they are all in good working order, and apply electrostatic locker paint. Our crew comes through and inspects all lockers to make sure they are in good working order. Adjusting doors, replacing missing hooks and handles, installing new identifying number plates, replace or repair existing locks, and electrostatically paint all lockers. Have multiple consecutive jobs scheduled? Let us coordinate! We have over 20 years of harmonizing job efforts to make sure your organization continues to operate at full capacity. American Office Services has over 20 years of experience in electrostatic locker painting, locker repair and refurbishing, and locker locks. We use specialized equipment that utilizes the latest in quality standards and technology to make sure your lockers look brand new when we're finished. Our on-site service offers you convenience, speed, quality and affordability. Locker Repair, Refurbishing, and Electrostatic Painting in: Alabama, Arkansas, Connecticut, Florida, Georgia, Illinois, Indiana, Kentucky, Louisiana, Maryland, Michigan, Minnesota, Mississippi, Missouri, New York, North Carolina, Ohio, Pennsylvania, South Carolina, Tennessee, Texas, Virginia, Washington D.C., West Virginia, Wisconsin and the rest of the continental United States.